Answer: B and D. The general rule to determine whether two devices’ interfaces should be in the same subnet is whether the two interfaces are separated from each other by a router. 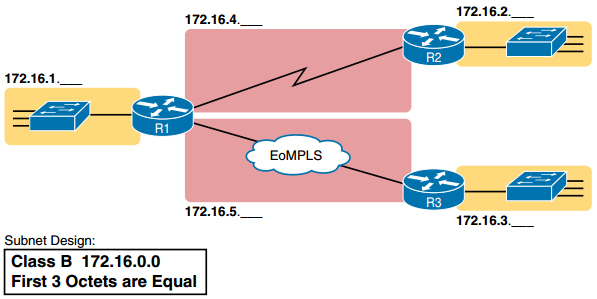 To provide a way for hosts in one VLAN to send data to hosts outside that VLAN, a local router must connect its LAN interface to the same VLAN as the hosts and have an address in the same subnet as the hosts. All the hosts in that same VLAN on the same switch would not be separated from each other by a router, so these hosts would also be in the same subnet. However, another PC, connected to the same switch but in a different VLAN, will require its packets to flow through a router to reach Host A, so Host A’s IP address would need to be in a different subnet compared to this new host. Q2. Why does the formula for the number of hosts per subnet (2 H – 2) require the subtraction of two hosts? Answer: D. By definition, two address values in every IPv4 subnet cannot be used as host IPv4 addresses: the first (lowest) numeric value in the subnet for the subnet ID, and the last (highest) numeric value in the subnet for the subnet broadcast address. Answer: B and C. At least 7 subnet bits are needed, because 26 = 64, so 6 subnet bits could not number 100 different subnets. Seven subnet bits could, because 27 = 128 => 100. Similarly, 6 host bits is not enough, because 26 – 2 = 62, but 7 host bits is enough, because 27 – 2 = 126 => 100. The number of network, subnet, and host bits must total 32 bits, making one of the answers incorrect. The answer with 8 network bits cannot be correct because the question states that a Class B network is used, so the number of network bits must always be 16. The two correct answers have 16 network bits (required because the question states the use of a Class B network), and at least 7 subnet and host bits each. Answer: A and C. The private IPv4 networks, defined by RFC 1918, are Class A network 10.0.0.0, the 16 Class B networks from 172.16.0.0 to 172.31.0.0, and the 256 Class C networks that begin with 192.168. Answer: A, D, and E. The private IPv4 networks, defined by RFC 1918, are Class A network 10.0.0.0, the 16 Class B networks from 172.16.0.0 to 172.31.0.0, and the 256 Class C networks that begin with 192.168. The three correct answers are from the public IP network range, and none are reserved values. Answer: A and C. An unsubnetted Class A, B, or C network has two parts: the network and host parts. Q7. A network engineer spends time thinking about the entire Class B network 172.16.0.0 and how to subnet that network. He then chooses how to subnet this Class B network and creates an addressing and subnetting plan, on paper, showing his choices. If you compare his thoughts about this network before subnetting the network, to his thoughts about this network after mentally subnetting the network, which of the following occurred to the parts of the structure of addresses in this network? a. The subnet part got smaller. b. The host part got smaller. c. The network part got smaller. d. The host part was removed. e. The network part was removed. Answer: B. An unsubnetted Class A, B, or C network has two parts: the network and host parts. To perform subnetting, the engineer creates a new subnet part by borrowing host bits, shrinking the number of host bits. The subnet part of the address structure exists only after the engineer chooses a nondefault mask. The network part remains a constant size. Answer: C and D. Subnet ID (short for subnet identifier), subnet address, and subnet number are all synonyms and refer to the number that identifies the subnet. The actual value is a dotted-decimal number, so the term subnet name does not apply. The term subnet broadcast, a synonym for the subnet broadcast address, refers to the last (highest) numeric value in a subnet.